A reply to some points raised in a booklet called “Exposing the Skeleton in the SDA Closet of 1888,” written by Norman Bradley. We have received a number of enquiries regarding issues raised in a booklet advocating the festivals, or “feast-keeping,” writen by Norman Bradley. The main premise is that the festivals were a hidden issue in 1888. Because the events of 1888 were pivotal for Seventh-day Adventists, this type of link would lend credibility to some. However, the evidence presented must be carefully examined. Here are a few notes on some points raised in the booklet. One of the issues debated in 1888 was the subject of the Law in Galatians. Was it the moral or ceremonial laws with was to “bring us to Christ?” Or both? It is inferred by Mr. Bradley that the debate encompassed whether or not the festivals were still to be observed. However, it is not at all clear that the festivals were a subject of debate in 1888. In fact quite the opposite—Mr. Bradley himself admits the evidence is lacking. The question of what law is referred to was certainly debated though. Which law is meant in Galatians may or may not have a bearing on the subject of the festivals. However, this (Galatians) is not the only evidence on the subject. Conclusions on the subject must take into account all of the evidence. Therefore, we must carefully consider all evidence in Bible and Spirit of Prophecy. See the other items in the Festivals Category for more of this evidence. Contributions of the SDA Pioneers should also be considered (since they are heavily referred to in the booklet – we need to let them speak for themselves, or else leave them out of it). There is a large amount of this material available widely as part of the Adventist Pioneer Library. None of it urges that the festivals are still in effect. The idea inferred here is that some of the annual sabbaths specified in Leviticus 23 are called “statutes.” Then other evidence is brought in to say that “statutes” are still binding and are part of the moral law. “The law of types reached forward to Christ. All hope and faith centered in Christ until type reached its antitype in his death. The statutes and judgments specifying the duty of man to his fellow-men, were full of important instruction, defining and simplifying the principles of the moral law, for the purpose of increasing religious knowledge, and of preserving God’s chosen people distinct and separate from idolatrous nations. “The statutes concerning marriage, inheritance, and strict justice in deal with one another, were peculiar and contrary to the customs and manners of other nations, and were designed of God to keep his people separate from other nations.” Review and Herald, May 6, 1875, pars. 5 & 6. The first thing to note is the general meaning of the word “statute.” It is an equivalent word for “law.” Hence any law could be called a statute. Some of the above are clearly ceremonial and even sacrificial ordinances. Some of them are more civil or administrative in nature. Therefore to simply take the word “statute” in Leviticus 23 as a connection to the moral law is tenuous at best. “After the completion of the tabernacle [the Lord] communicated with Moses from the cloud of glory above the mercy seat, and gave him full directions concerning the system of offerings and the forms of worship to be maintained in the sanctuary. The ceremonial law was thus given to Moses, and by him written in a book. But the law of Ten Commandments spoken from Sinai had been written by God Himself on the tables of stone, and was sacredly preserved in the ark. “There are many who try to blend these two systems, using the texts that speak of the ceremonial law to prove that the moral law has been abolished; but this is a perversion of the Scriptures. The distinction between the two systems is broad and clear. The ceremonial system was made up of symbols pointing to Christ, to His sacrifice and His priesthood. This ritual law, with its sacrifices and ordinances, was to be performed by the Hebrews until type met antitype in the death of Christ, the Lamb of God that taketh away the sin of the world. Then all the sacrificial offerings were to cease. It is this law that Christ ‘took… out of the way, nailing it to His cross.’ Colossians 2:14. But concerning the law of Ten Commandments the psalmist declares, ‘Forever, O Lord, Thy word is settled in heaven.’ Psalm 119:89. And Christ Himself says, ‘Think not that I am come to destroy the law…. Verily I say unto you’—making the assertion as emphatic as possible—‘Till heaven and earth pass, one jot or one tittle shall in no wise pass from the law, till all be fulfilled.’ Matthew 5:17, 18. Here He teaches, not merely what the claims of God’s law had been, and were then, but that these claims should hold as long as the heavens and the earth remain. The law of God is as immutable as His throne. It will maintain its claims upon mankind in all ages.” Patriarchs and Prophets, pp. 364:3-365:1. How do we distinguish between the different types of laws/statutes/ordinances? “God’s people, whom he calls his peculiar treasure, were privileged with a two-fold system of law; the moral and the ceremonial. The one, pointing back to creation to keep in remembrance the living God who made the world, whose claims are binding upon all men in every dispensation, and which will exist through all time and eternity. The other, given because of man’s transgression of the moral law, the obedience to which consisted in sacrifices and offerings pointing to the future redemption. Each is clear and distinct from the other. From the creation the moral law was an essential part of God’s divine plan, and was as unchangeable as himself. The ceremonial law was to answer a particular purpose in Christ’s plan for the salvation of the race. The typical system of sacrifices and offerings was established that through these services the sinner might discern the great offering, Christ.” Review and Herald, May 6, 1875, pars. 3 & 4. “The types and ceremonies, with the prophecies, gave ancient believers a veiled or indistinct discovery of the mercy and grace to be brought to light through the revelation of Jesus Christ to our world. The law itself would have no glory were it not that Christ is embodied in it. The revelation of Jesus Christ cast its glory back into the Jewish age. The law had no power to save. It was lustreless, only as Christ was represented in the law as the One full of righteousness and truth.” Bible Echo, August 4, 1902, par. 5. How is one clearly distinguished from the other? Ceremonial: “Christ was the foundation of the whole Jewish economy, and in all his specific directions regarding the ceremonial observances, these were distinguished from the Decalog. They were to pass away. Type was to meet antitype in the one great offering of Christ for the sins of the world.” Signs of the Times, July 29, 1897, par. 10. “The ceremonial system was made up of symbols pointing to Christ, to His sacrifice and His priesthood.” (PP 365:1). Some mention is made of a couple of articles by Uriah Smith in January 1888. These are quite enlightening reading on their own, and if accepted, would in fact answer very well the question regarding the festivals for all those Seventh-day Adventists who are inquiring about their proper place in our religious experience and understanding today. The articles were reprinted in a tract entitled “What Was Nailed to the Cross?” The entire text of the tract can be found under Smith’s name in the Words of the Adventist Pioneers section of the EGW Writings CD-ROM. One of the objections to the seventh-day Sabbath being still in effect today is that it is done away according to Colossians 2:14-17. This objection Uriah Smith ably answers, by showing that the ceremonial sabbaths are what was meant in Colossians 2. “There was another law communicated privately to Moses, and written by him in a book, called “the book of the law,” which consisted of instructions in regard to meats, drink, feast-days, divers washings, and carnal ordinances, and which was deposited, not in the ark, but by its side. The difference between them in this respect was this: The ten commandments lay in unapproachable majesty inside the golden ark, deep graven by the finger of Deity himself in the imperishable agate of the mountains; the law of types and ceremonies lay outside the ark, written with ink, by human hands, on the perishable parchment.” Uriah Smith, What Was Nailed to the Cross?, p. 2. “We say that Col.2:14-17 refers exclusively to the ceremonial law, having to the moral law not the remotest allusion whatever. And he who endeavors to hide behind this scripture as his defense for the neglect or violation of any moral duties, will stand at last in the judgment ashamed of his folly and speechless in his condemnation.” Uriah Smith, What Was Nailed to the Cross?, p. 3. “‘Sabbaths which are a shadow,’ as Paul expresses it, is a declaration that there are sabbaths which are not a shadow, and these last are excluded from the things of which he is speaking. There are many considerations which show that the weekly Sabbath cannot by any possibility be included in the sabbaths of which the apostle speaks in Col.2:16. The weekly Sabbath did not have its origin with meats, drinks, festivals, new moons, and ceremonial, or annual, sabbaths. It originated during man’s independent, innocent condition before the fall (Gen.2:2,3,) and was thus placed among the original, primary laws which would always have governed him though he had never sinned; while the latter originated with the ceremonial system introduced at Horeb. It did not rest on the same authority with them. Its authority rested upon the voice of God, and the writing of God upon the tables of stone; the ceremonial system was found only in the book written by Moses. It was not ‘against us,’ as were the things of which Paul is speaking; for ‘the Sabbath was made for man.’ Mark 2:27. It was not ‘contrary to us,’ for there is no commandment or institution anywhere singled out to which so great blessings are attached as are promised to the keeping of the Sabbath, not to the Jews only, but to the Gentiles also. See Isa.56:6,7; Jer.17:24,25; Isa.58:13,14. There is no necessity for including the weekly Sabbath in the expression, ‘sabbaths which are a shadow of things to come,’ inasmuch as there were other sabbaths, of the same nature as the feast-day and new moons mentioned, in number amply sufficient to meet the demands of the apostle’s language.” Uriah Smith, What Was Nailed to the Cross?, pp. 7, 8. “It thus appears, beyond any possibility of reasonable question, that Paul, in Col. 2:16, had no reference whatever to the weekly Sabbath of the Lord, but only to the seven annual sabbaths of the Jews.” Uriah Smith, What Was Nailed to the Cross?, p. 16. “In the January 17th and 24th issue of the Review and Herald in 1888, he gave a long detailed study in which he separated six of the annual feast day Sabbaths into an inferior position from the Day of Atonement Sabbath. It must have taken years to study out. He said he was doing this to respond to the charges the Sunday keeping churches were giving him, but he could have answered them in a more brief way. It appears he was really finding a way to get rid of six of the feasts while retaining one – the Day of Atonement.” Norman Bradley, Skeleton, p. 34. Having read the articles we cannot see how this conclusion can be drawn. One should read the articles and form their view of what was meant from the articles themselves. Then there is the question about “Brother Smith’s Piece in the Review.” It is referred to below – and the question then is, what is she referring to? “God has opened to us our strength, and we need to know something about it and be prepared for the time of trouble such as never was since there was a nation. But here is our strength, Christ our righteousness. Let us ask Isaiah who is to be our strength. Well, he answers, and it comes echoing down along the lines to our time: ‘For unto us a child is born, and unto us a son is given; and the government shall be upon his shoulder: and his name shall be called Wonderful, Counsellor, the mighty God, The everlasting Father, The Prince of Peace’ [Isaiah 9:6]. Is not that enough for us? Cannot we cover ourselves all over with it? Do we need any of our own self esteem? No, we cannot have that. We must hide in Christ, and we can hide in the mighty strength of Israel’s God. Thus we work to meet the powers of darkness. We fight not against flesh and blood, but against principalities and powers, and spiritual wickedness in high places. And it is only in Christ that we can meet them. The piece almost certainly referred to is “Our Righteousness.” It was published in the Review dated a week before Sr White’s sermon – June 11, 1889. “Some of our correspondents are beginning to drop remarks leaning very suspiciously toward the view that any attempt on our part to keep the commandments, is simply an attempt to make ourselves better, which we can never do; that it is an attempt to be righteous, which is simply to cover ourselves with filthy rags; for the prophet says that ‘all our righteousnesses are as filthy rags.’ Isa. 64:6.” Uriah Smith, Review and Herald, vol. 66, no. 24, June 11, 1889, p. 376. It was all about the issue of “our righteousness,” and certainly must have been a reflection on the ideas on righteousness by faith presented in 1888 which were being widely discussed. “Suppose we try the ‘filthy rag’ construction on Matt. 5 : 20: ‘For I say unto you that except your ‘filthy rags’ shall exceed the ‘filthy rags’ of the scribes and Pharisees, ye shall in no ease enter the kingdom of heaven.’ That surely would not be very edifying reading to any one. There is then a righteousness that we must have, to be secured by doing and teaching the commandments. Verse 19. And the scribes and Pharisees did some things which were righteous, or Christ could not have introduced the comparison he did, and said, except yours shall exceed theirs. ‘He that doeth righteousness,’ says John, ‘is righteous.’ 1 John 3:7. And if he does not do righteousness, he is not righteous.” Uriah Smith, Review and Herald, vol. 66, no. 24, June 11, 1889, p. 377. If you are looking for a real 1888-era controversy, this is it! For more on the controversy over Righteousness by Faith, see Obedience or Righteousness. “I do not wish to ignore or drop one link in the chain of evidence that was formed as, after the passing of the time in 1844, little companies of seekers after truth met together to study the Bible and to ask God for light and guidance…. The truth, point by point, was fastened in our minds so firmly that we could not doubt….The evidence given in our early experience has the same force that it had then. The truth is the same as it ever has been, and not a pin or a pillar can be moved from the structure of truth. That which was sought for out of the Word in 1844, 1845, and 1846 remains the truth today in every particular. Letter 38, 1906, pp. 1, 2.” Manuscript Releases, vol. 1, p. 52:1. Our understanding as SDAs of the sanctuary in heaven is built on a solid understanding of the entire ceremonial law—including the distinction to be made between moral and ceremonial. It is our concern that SDAs today who feel the festivals are “still binding on God’s children” will one day realize that they have taken an untenable position. What will they do then? Will they then also give up the Sabbath? Instead of standing on shaky ground, we need to stand on the truth. “Satan knew this, and he was at work in mighty power to keep the minds of as many people as he possibly could wavering and unsettled on the truth. I saw that the mysterious knocking in New York and other places was the power of Satan, and that such things would be more and more common, clothed in a religious garb so as to lull the deceived to greater security and to draw the minds of God’s people, if possible, to those things and cause them to doubt the teachings and power of the Holy Ghost.” Early Writings, p. 43:2, 3. In order to receive the seal, we must be firmly settled on the truth. “Just as soon as the people of God are sealed in their foreheads—it is not any seal or mark that can be seen, but a settling into the truth, both intellectually and spiritually, so they cannot be moved—just as soon as God’s people are sealed and prepared for the shaking, it will come. Indeed, it has begun already; the judgments of God are now upon the land, to give us warning, that we may know what is coming.” SDA Bible Commentary, vol. 4, p. 1161:6. We appeal to every reader to be as the Bereans, search carefully for yourself, and understand and be settled into the great truths which have defined the Advent movement since its beginning. 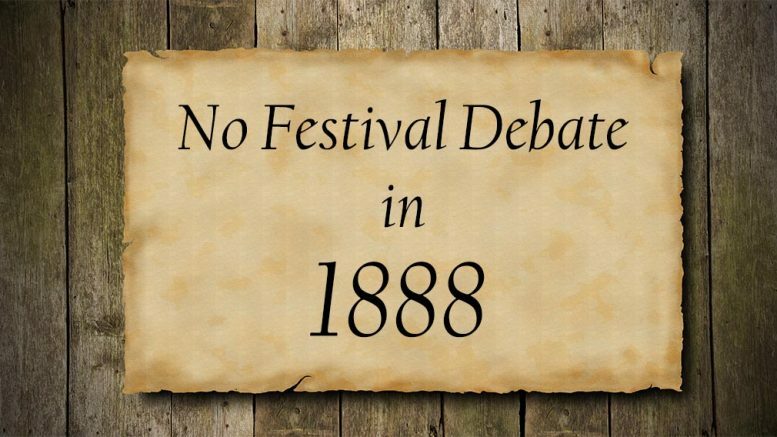 Be the first to comment on "Festivals Not an Issue in 1888"